Ink Cartridges are made of special imported bonded cellulose fiber (not woolen felt) in various sizes from 20 mm to 100-mm width & any length having very high absorbing capacity and long life. Aluminium Body Cartridges are made for Blister packaging machine, FFS machines & Coding machines. The absorbing capacity is quite high. 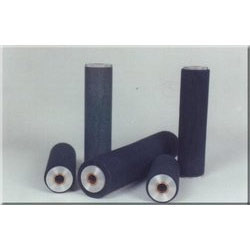 The cartridges are made in various ID, OD's & Length depending on customer requirement. 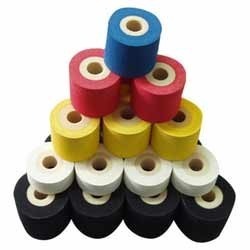 Inking Cartridges, Rollers & Pads are manufactured from special imported bonded cellulose fiber, which have a solid, highly durable and Inking Felt Tubes & Pads are made from VIRGIN Australian wool of various densities from .35 to .60 depending on the requirement of customers. 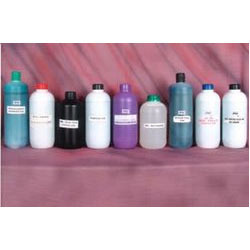 Antifreeze coding ink which we offer are available in Black, blue, red, violet, green, golden, white, silver, etc colors. These are food grade & anti-freeze type suitable for butter, milk, oil, laminated surfaces, BOPP, aluminium foil, metal, glass, etc. Antifreeze coding ink are quick-drying, water resistant, and can be used on Glazed, Metallic surfaces, etc. and are resistant to lubricants and spermicides. Available colours are Black, Red, Violet, Brown and Blue. Porous Inks Grade are water based and work on corrugated Boxes, Labels, Card Board sheets, plywood, etc. These are environment-friendly inks & can be used as stamp pad ink also. Instant Marking Inks works on metal etching principle and marks permanent acid, alkali, heat & solvent resistant marks on Steel, Brass, Copper, Zinc, Tin & their Alloys. Color : Black, Blue, Red, Violet, Green, Golden, White, Silver, etc. which are food grade & anti-freeze type suitable for butter, milk, oil, laminated surfaces, BOPP, aluminum foil, metal, glass, etc. Rubber & Polymer Grooved Flat Stereos are used for making different statutory information's on packing. The message is composed using lock types stereos that inter lock into the grooved belt and are inked by coding ink. The grooved belt is available in 2" x 18" size. You may cut it to your required size. Lock types are molded from specially formulated rubber to give sharp & clear impressions & are available in standard combinations of numerical & alphabets. Lock types are available in 1.5mm, 2.0mm, 2.5 mm, 3mm, 4 mm, 14mm, and 25mm sizes. Available in size of 2" x 18"
We offer exclusive ranges of Hot Ink Rollers these HOT INK ROLLERS do not require adding or charging of conventional inks. The ink in the hot ink roller is solid at room temperature and does not smudge. It is non-toxic, gives sharp impressions and contains solvent free ink and therefore there are no hazards possible as in the conventional ink. 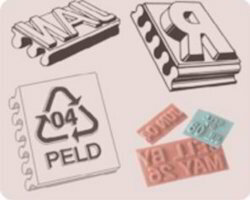 They are used in high-speed code date marking equipment in a wide variety of industries such as food industry, Pharmaceuticals, dairy, frozen food etc. They are made in sizes to fit all models of hot ink roller machines (such as Markem® or Norwood®). 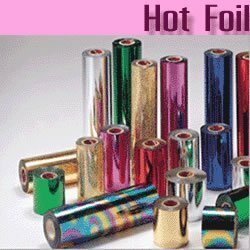 We offer exclusive ranges of Hot Foils.These Hot Files are Extremely versatile date-coding foil and provide High-speed. These Hot Files work on low working temperature. We are engaged in manufacturing and supplying a wide range of Consumables. These are manufactured using quality components and ensure the longer service life. Our wide assortment of consumables are easy to use and find extensive usage in Engineering Industries. Looking for Consumables & Accessories ?